What next for the NIP? 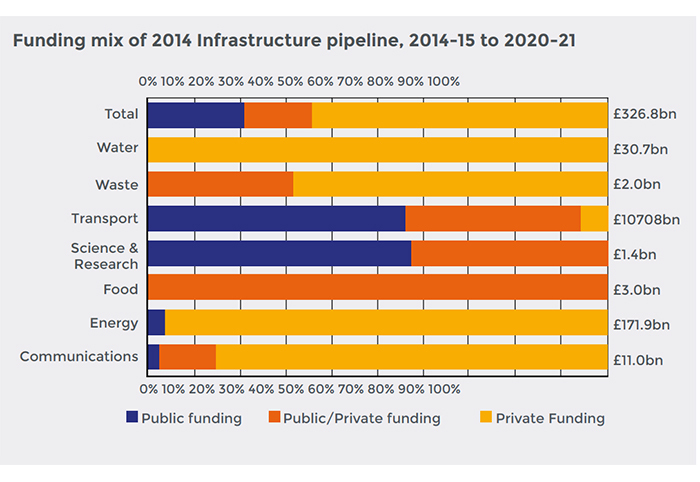 The NIP sets out the Government’s infrastructure priorities up until 2021 and remains a key document to help the new Tory government deliver its infrastructure and growth ambitions. Jackie Whitelaw updates progress. There are four things to understand about the National Infrastructure Plan. One, it is a document produced by the Treasury which presents detail on the planned investment in roads, rail, local transport, aviation, ports, energy, flood protection, communications, water, waste, and science and research to maintain the country as a leading developed nation. At the latest count in the 2014 NIP that amounts to a pipeline of £466bn for the next 10 years. There is more detail in the plan on the years to 2021 and in that timeframe investment in infrastructure is expected to amount to £327bn. Two, it should not be read simply as a plan for national infrastructure investment only but as a starting point for development and regeneration generally. Schemes in the plan are sited around the regions and knowledge that they are en route is intended to allow developers and councils to make their own local investment plans alongside. Three, it increasingly underpins the strategy for UK economic growth. 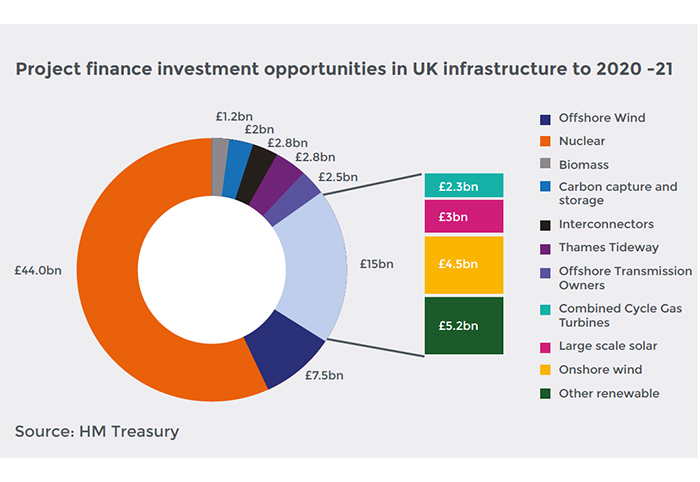 Infrastructure creates jobs while it is under construction – 5000 for every £1bn spent according the Treasury - and jobs when the schemes are finished. Alongside that investors and international business want to back countries that are modernising not declining. Good, up to date, well maintained infrastructure is part of that. The UK currently ranks 27th out of 144 for the quality of its infrastructure according to the World Economic Forum. The ambition is to rise up the rankings. And four, it has forced infrastructure right up the political agenda. For those working in the infrastructure sector all this is a remarkable turn of events and one they want to be confident will continue. For decades they have been used to governments employing investment in major infrastructure projects in a stop-go manner, providing enthusiastic support one day and then cancelling a scheme in a second to act as an instant brake on spending. But the change in approach has put the sector rather on the spot. The construction industry which builds new infrastructure is notoriously inefficient and costly. This is something it has always been able to blame on a fickle government client that constantly changed the scope of a project and which never provided a pipeline of work to allow the industry to take the teams and the knowledge from one job to the next and do it better. It can’t do that any more. So there is a fifth element of the NIP to understand. Its existence and the political enthusiasm for infrastructure investment means the construction sector now has to deliver what it always said it could – project by project cost efficiencies and on time delivery by a well-trained workforce. Industry knows it has been given a once in a lifetime opportunity to prove its mettle and the NIP is effectively forcing innovation and collaboration onto a notoriously traditional and combative sector. And as devolution takes hold in the English regions as well as the UK nations, NIP is also driving local investment and employment plans. “It is a document that sets out the investment strategy for UK plc,” ACE chief executive Nelson Ogunshakin. The original idea for a National Infrastructure Plan came from the Labour Government in 2009 but the thought was that it would be a one off, what do we need list that would focus the minds of spending departments. After the election of 2010 the coalition government picked up the concept but decided it should be an annual report from the Treasury alongside the Autumn Statement. The first one appeared in autumn 2010 and they have appeared every year since with the 2014 NIP being the fifth iteration. Over that time the NIPs have changed from a shopping list to whatnow exists which is much more of a delivery plan. “It is a document that sets out the investment strategy for UK plc,” says ACE chief executive Nelson Ogunshakin. He co-chairs, with the chief secretary to the Treasury, the National Infrastructure Plan Strategic Engagement Forum. NIPSEF provides feedback to the Treasury from construction CEOs, asset owner, investors and financiers and stakeholder groups representing end users like the CBI. “We started off by saying there was no vision, structure or consistency and we needed a pipeline. We have that now and NIP has put shape on what the UK’s intentions are for investors on its infrastructure investment programme ,” he says. A key change in 2014 was the inclusion of a chapter on funding and finance to explain how this infrastructure is going to be paid for. Last March the Treasury produced its first finance update on the NIP and that, with some additions and expansions, is what ended up the final NIP document in December. 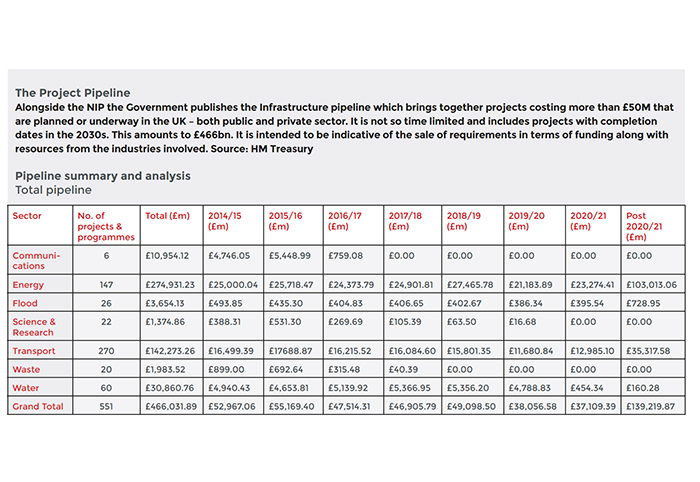 What it revealed was that public money is paying for 20.6% or £67.5bn of current projected spending up to 2021; public-private investment (with the private funding including contributions from developers benefiting from infrastructure construction) is providing 13.8% or £45bn and totally private sector investment makes up 65.6% or £214.4bn. This last lump of money in large part comes from on balance sheet corporate investments in sectors such as water, ports and airports. The private sector is being asked to provide just over a third of the finance or £79bn through project specific finance. “Government is saying we are not looking to finance everything. The taxpayer is paying directly for a large part of that, or the consumer through the regulated industries. What needs financing is £79bn. The size of the challenge is much smaller than people perceived and that was a message the markets largely didn’t want to hear. Also, aside from the £4.1bn Thames Tideway Tunnel, the financing government is looking for is all in energy and a lot of that (£45bn) is nuclear,” says partner in corporate finance infrastructure at KPMG Darryl Murphy. The expectation is that the NIP will continue post election and if it does Murphy would like any future version to contain more information on social infrastructure – schools, hospitals, government buildings. These are lower risk projects compared to power plants, tunnels and railways, that developers are happier to get involved with. They could also come with reliable tenants and long term stable returns that investors, particularly pension funds, would be comfortable to support. He is not on his own in this view. Following the recent Green Sky Thinking Week in London, Mace chief executive Mark Reynolds was keen to see a broader strategic role for the next NIP linking economic infrastructure with social infrastructure and housing. Without the ability to truly join up different silos of investment from transport to energy to housing to education and health, the country could struggle to create the vital businesscases needed to attract private sector investment and so underpin the public funds available. For many, skills is the area that needs focus. The Construction Industry Training Board said in January that 200,000 extra workers were needed in the next five years to keep on top of rising demand. In the professional arena, demand is as intense. “Infrastructure is a long term game, with major developments sometimes taking decades to build,” says strategic development manager for consultant Mott MacDonald Simon Harrison. “Without timely and orderly delivery of public infrastructure it is difficult to plan our investment in the growth of necessary skills. Engineers able to take leadership of complex infrastructure projects need to have developed rounded experience over perhaps 20 years since graduation before they are able to tackle the largest projects, and they need to have made decisions to chose science, technology, engineering and maths courses at school perhaps 10 years earlier still. It was announced that there would be a skills NIP just before the election at the ACE annual conference. The hope is the new government will continue with this plan. “What is important now is that a political consensus is built around the long term plan so election cycles do not derail the much longer timescales needed to plan and create new infrastructure and to develop the people who can do this.” Harrison adds. The general feeling is that the NIP needs to be linked to implementation over a longer time frame to give financiers, industry and individual confidence in its delivery. “The National Infrastructure Plan, when launched in 2010, was the first of its kind. It made us a world leader in infrastructure planning,” says WSP UK managing director Mark Naysmith. “By providing better visibility of the forward pipeline and national priorities it has enabled businesses to plan for the long term and having certainty in specific projects has meant businesses can plan for and retain specialist skills that might otherwise have been lost. “Post election, with the new government relying on the private sector to both fund and deliver infrastructure, continued strong commitment to the NIP is vital for maintaining business confidence,” says AECOM head of government and public John Hicks. “So my ask of the incoming government is this: build on the excellent foundation of the NIP but now focus on delivery. Last word, post election goes to ACE’s Ogunshakin. “Industry needs the government to honour the electorate’s wish for political stability and policy continuity to attract investment in much-needed social and economic infrastructure,” he says. “The National Infrastructure Plan, when launched in 2010, was the first of its kind. It made us a world leader in infrastructure planning,” WSP UK managing director Mark Naysmith. “Notwithstanding, it is crucial that infrastructure continues to enjoy the cross-party support that has characterised the past five years. It must remain above the fray when progressing with the planning, financing, funding and execution of the current project pipeline contained in the National Infrastructure plan,” he says. “ACE and the wider industry will continue to be a strong advocate for working with the ruling government and opposition, Treasury, Infrastructure UK and other key delivery departments to drive forward investment in infrastructure,” he continued. A version of this article first appeared in Public Finance.